You and your team can use #hashtags to categorize and group your check-ins. When entering a check-in, the “#” symbol will auto-complete to the available tags, and check-in text with a #hashtag will be automatically linked. 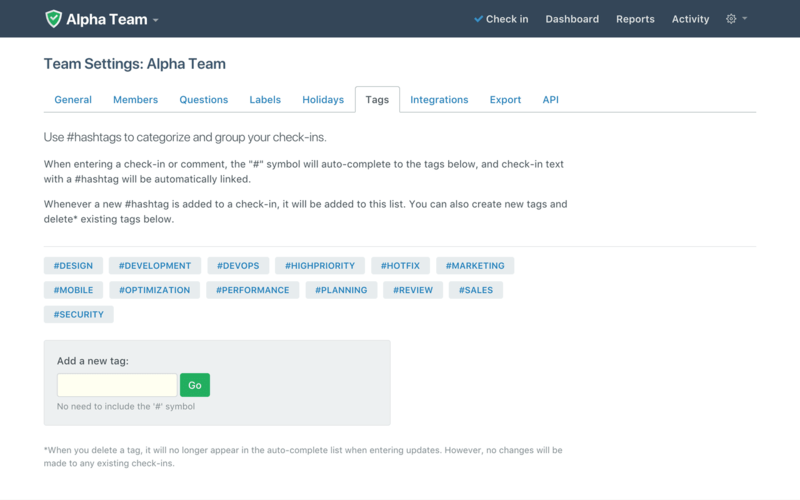 Tags are an easy way to categorize and view check-ins on a specific project or area. Whenever a new #hashtag is added to a check-in, it will be added to the available list. Status Hero comes with a set of default tags and the Administrator or Team Managers can add custom tags in Team Settings - Tags. Here you can add new tags or delete existing tags.